It's interior designer Keith Langham's favorite and the piece de resistance of Brennan's. A fantasy interpretation of a French Orangerie, the Main Dining Room "holds hands" with the courtyard, inviting the outside in through a spectacular wall of glass. 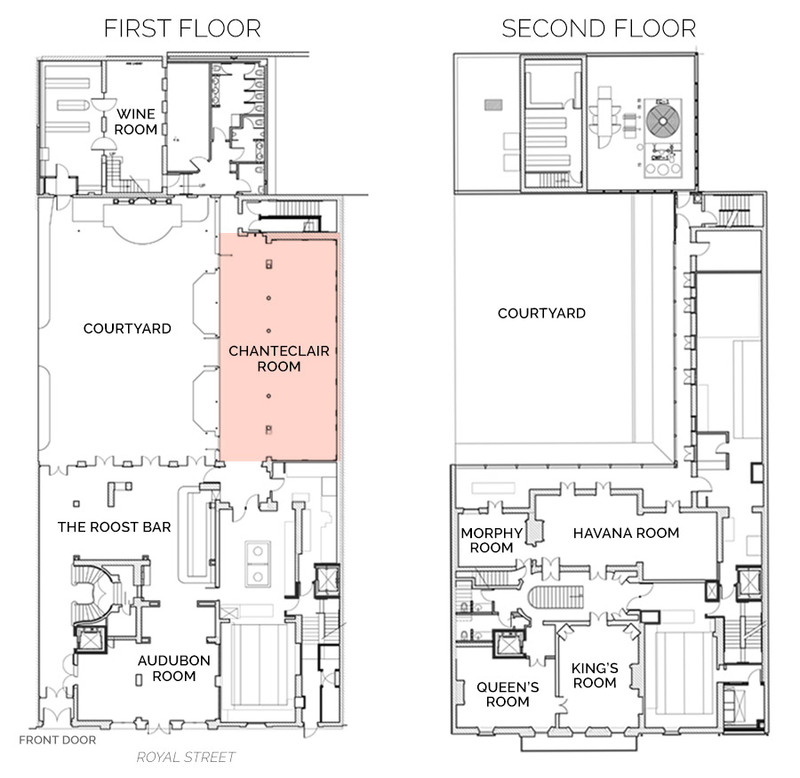 Originally four rooms, the space is now sixty by forty feet, seats 100 people, and marks the most significant alteration to the restaurant. The room is clad in a soft green painted trellis and the walls are wrapped with whimsical murals inspired by 19th century Proteus parade floats. Features of Old World elegance include crescent-shaped banquettes in dark green tufted leather, wicker covered rattan chairs in deep pink leather, and checkerboard patterned floor in green and white with cabochons of pink. Tole and pink glass chandeliers, wall lights with salmon colored silk shades, and large French planters with potted citrus accent the room, completing the classic design. 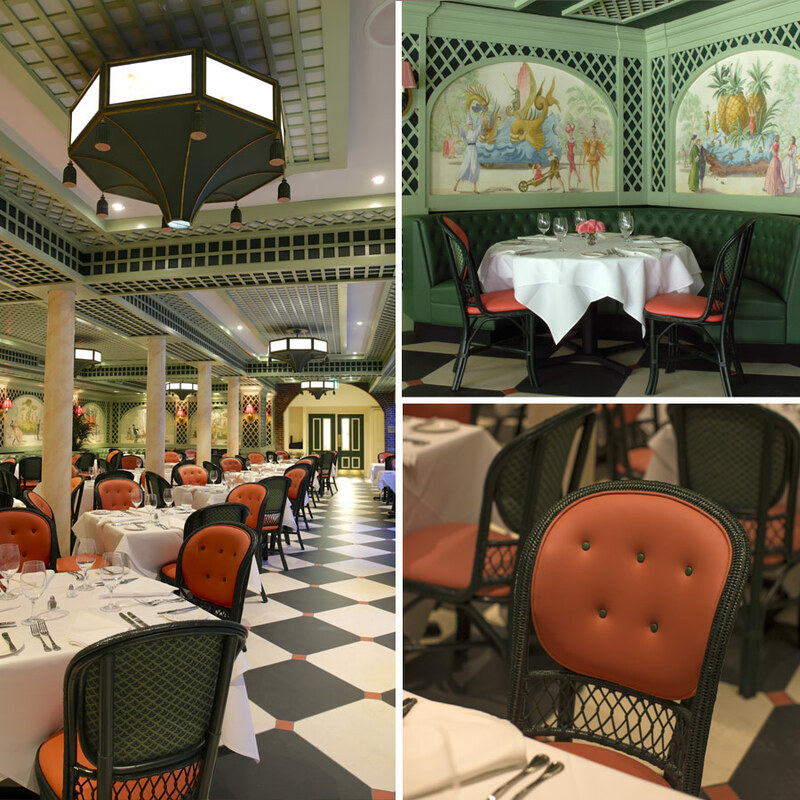 *Please note the Chanteclair Room serves as Brennan's main dining room. The minimum food and beverage expenditure associated with booking the Chanteclair Room is based on forgone à la carte revenue. We will happily work with you to deliver enhanced private party menu and beverage options to ensure a premium event experience.